1. You have a post-graduate specialization in neuroscience and education. How do you use this knowledge in your daily life at Graded? Our brains are constantly growing and changing. All our experiences - either from our interaction with the environment or with other people - have a direct influence on the plasticity of our brains. We learn from many different sources, and all of them enrich us and turn information into knowledge. We then incorporate that into our long-term memory. Becoming more aware of this was important and has helped me to consciously try out different teaching strategies. My goal is to always focus on the students and create the best possible conditions for their learning. 2. 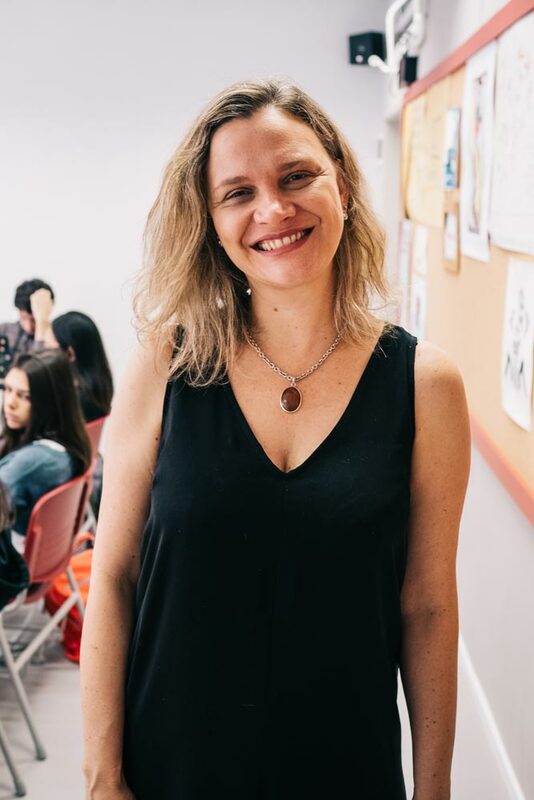 In addition to extensive experience teaching Portuguese language and literature, you have also taught and written articles about literature and film. How did you become interested in film? I have loved movies since I was a teenager. As a result, I have been a member of several film clubs, and I have also had the opportunity to teach a course on cinema and literature. As a teacher, I know that movies can be a good resource for students, especially when the movies are connected to specific themes or texts that we discuss in class. Through film analysis, students also understand better how style and language are used to produce a specific message. I started teaching when I was 13. My Portuguese teacher invited me to be part of a community service project, and my job was to develop music activities and tell stories to young children in a school with limited resources. This experience showed me that education is the best way to truly interact with people, and that this interaction is an opportunity for constant transformation, both for the teacher and the students. 4. If you were not a teacher, what job would you have? When I was a child, I dreamed of being an astronomer. I would still love it, but I think I have an overly romantic and unrealistic notion of what astronomers do. I really just love the stars and always want to learn more about them. 5. What one word sums up your high school experience? Why? Friendship. High school was a period during which I strengthened some very special bonds. My friends and I used to spend a lot of time together, developing cultural and social projects involving music and poetry both in and out of school. We lived in Serra Negra, a small, quiet town with a great sense of community, so felt as if we were one big family. I sometimes miss it, but the teenager that I was still lives inside me, and she is a permanent source of courage, joy, and freedom. I will always regret not having spent more time with the people I love who have already died. Relationships are my priority, and I usually feel terrible when I am not able to devote as much of myself as I would like to the ones I love. 7. Where is your favorite place to take out-of-town guests visiting São Paulo? Downtown. Every time I visit a city for the first time, I try to take a walk through its downtown because I can clearly see a city’s history and culture through its architecture, art, music, markets, restaurants, and people in their daily routines. São Paulo is no different, so downtown is where I take visitors. 8. You are the college counselor for Brazilian universities. What is going on in that area? The number of students interested in attending colleges in Brazil has grown significantly in the past few years. One of the reasons for this is that some universities accept the IB diploma as a form of entry without the need of "vestibular" or ENEM exams. This started in the middle of 2016. Currently, five universities accept the IB diploma: Fundação Instituto de Administração (FIA), Escola Superior de Propaganda e Marketing (ESPM), Fundação Armando Alvares Penteado (FAAP), the business and economy schools at Fundação Getulio Vargas (FGV), and Instituto Brasileiro de Mercado de Capitais (IBMEC). We are adapting the Brazilian counseling program to this new reality. Our university visits are an important part of the process. Besides the visits, students participate in different workshops and study groups held at these universities. This year, several juniors and seniors took part in projects and classes at IBMEC, ESPM, and FGV, and Insper. 9. What book in Portuguese do you feel all high school students should read, not for academic reasons but simply because it is fun or interesting? I think that high school students should read more Brazilian poetry. There are a lot of great poets that I could mention, but reading Paulo Leminski’s poems is a great idea. Mostly of Leminski's texts are short and deep. They are easy to understand, but they have a profound meaning. Leminski's collection, Toda poesia, is a fantastic starting point. What I like the most at Graded is my interaction with students, both as a teacher and as a Brazilian college counselor. There is a great sense of community here at Graded and, at the same time, it is much easier to work with students individually than at most schools in Brazil. This high-quality interaction is a true privilege.